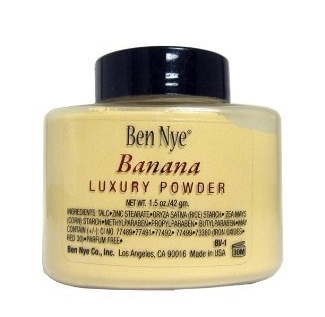 For months and months I've been trying to get a good deal on a Ben Nye Banana Powder, but it's always very expensive online - the shipping cost mostly. If you don't know what Banana Powder is, it's this very hyped yellow translucent powder made famous by Kim K. It seems to suit all skin tones & looks like a great highlighting powder. Lots of people are making money on Ebay by selling samples of it in little plastic pouches. I want the 1.5 oz bottle, but now I'm tired of looking! Only today I found the powder online for $15....I was excited....until I saw shipping was $19.99! Da fudge! Maybe I'll just wait for Ben Nye to come to India. I read more about Ben Nye Banana Powder, and it's described as a beige with yellow tones. It feels smoother & blends better. Now I'm not claiming my creation is the ultimate dupe for the original Banana Powder, but I was surprised to see that it works quite well when applied - over concealer & all over my face. Yes, yes! I got the big one for just 900 bucks! NBC in Khar. @Magali- 900 bucks is so decent! i also want it ....may u send it to me? I wanted to try, yet again the shipping charges too high! This DIY is tempting! I want to buy the Ben Nye one too, but then I have no patience to wait for shipping, so never ordered it. This one looks great actually. I bought the Ben nye powder in the UK via gurumakeup. But I must agree it was not cheap! However I do enjoy using it as a colour corrector and undereye setting powder. Ordered mine though a friend in Bombay.. From new Beauty centre. About 950/- I'd suggest you go the same. Hey Girls. debasree banerjee is correct we get it Mumbai. I purchased mine from Beauty Center Khar for 950 RS. for a 85gm/ 3oz bottle last year, price might have gone up since then. I tried it,It simply works wonders for my skin and ur technique was of great help iam surely incorporating this for my wedding rather than spending tons on makeup artist its an absolute value for money Super duper Inexpensive miracle product and one of the most affordable dupe ever one could have for the Ben Nye Banana Powder.. Thank a ton ×××love××Huge Hugs & Kisses!!!! !Stay Blessed..Keep up the Great work! hey, so i bought the star yellow matt powder and it suits my skin just fine, i only use it to highlight my undereye area and my T zone, i am an NC43 in MAC, i am guessing you are lighter than me, or have a pink undertone which is why it looks too yellow on you?! am i right? Back to my original point, I got excited to see from these comments that the Banana powder is available at Beauty Centre in Mumbai and its possible that the other powders may be too. However after thinking about it a bit, I realise that the price is suspiciously low - it's even lower than the price at CRC so something looks fishy! As there are plenty of dupes out there, I would recommend you proceed with caution. As Indians we are always happy to get a good deal but we are not as conscious about quality as we should be.